Set at the end of World War II, in a crumbling Bavarian castle that once played host to all of German high society, a powerful and propulsive story of three widows whose lives and fates become intertwined—an affecting, shocking, and ultimately redemptive novel from the author of the New York Times Notable Book The Hazards of Good Breeding. Amid the ashes of Nazi Germany’s defeat, Marianne von Lingenfels returns to the once-grand castle of her husband’s ancestors, an imposing stone fortress now fallen into ruin following years of war. The widow of a resister murdered in the failed July 20, 1944, plot to assassinate Adolf Hitler, Marianne plans to uphold the promise she made to her husband’s brave conspirators: to find and protect their wives, her fellow resistance widows. First Marianne rescues six-year-old Martin, the son of her dearest childhood friend, from a Nazi reeducation home. Together, they make their way across the smoldering wreckage of their homeland to Berlin, where Martin’s mother, the beautiful and naive Benita, has fallen into the hands of occupying Red Army soldiers. Then she locates Ania, another resister’s wife, and her two boys, now refugees languishing in one of the many camps that house the millions displaced by the war. As Marianne assembles this makeshift family from the ruins of her husband’s resistance movement, she is certain their shared pain and circumstances will hold them together. But she quickly discovers that the black-and-white, highly principled world of her privileged past has become infinitely more complicated, filled with secrets and dark passions that threaten to tear them apart. Eventually, all three women must come to terms with the choices that have defined their lives before, during, and after the war—each with their own unique share of challenges. Written with the devastating emotional power of The Nightingale, Sarah’s Key, and The Light Between Oceans, Jessica Shattuck’s evocative and utterly enthralling novel offers a fresh perspective on one of the most tumultuous periods in history. 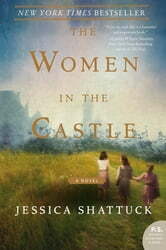 Combining piercing social insight and vivid historical atmosphere, The Women in the Castle is a dramatic yet nuanced portrait of war and its repercussions that explores what it means to survive, love, and, ultimately, to forgive in the wake of unimaginable hardship. A fast moving story about three women who come together from different backgrounds. Filled with surprises and shows the power and strength that women have when put to the test. This book shows the war from a different perspective and the ending leaves room for another book. I enjoyed it. As tough as the subject is-this is an incredible read. It was easy to follow and connect the characters lives. It was so real, raw and messy-just like life! We so want an easy and immediate solution and we find in this story heart wrenching choices. Very golf read. Almost need to read it twice. Good perspective. A must read for everyone interested in what really happened during WWII. An insight in how it was to live and survive in the midst of the war. How women and their children were able to continue on and live through the horrors of losing family, close friends, turning neighbours against neighbours. Keeps you captive right to the end.